Coaches can be judged by many different metrics. For the elite in the Southeastern Conference, schools judge their coaches on SEC and national championships. Those limited standards, however, do not take the context of each program into consideration. At CollegeFootballWinning.com, of course, we are most concerned with metrics that reveal something about a team’s sports-betting status. We are especially interested in a metric that does take context into consideration. Consequently, our favorite sports-betting metric for assessing coaches relative to public expectations (which drive betting lines) is the margin of victory (MOV) against-the-spread (ATS). [To read all about MOV ATS and its efficacy as an assessment tool, please CLICK HERE.] Although a reason is never needed to write about the SEC when it pertains to college football, on the heels of SEC media days, we thought it appropriate to apply MOV ATS to all the SEC West coaches and see who has done the best job of beating expectations at his respective school. By these data, Gus Malzahn is at the top of his class, and by no small margin. When considering the results, however, it is important to remember that these figures represent a coach’s success relative to public expectations. When a coach has won multiple national championships (Saban) it becomes very difficult to continue to exceed public expectations. It might also be worth noting that, as with many statistical categories, given a large enough sample size, there will be a tendency toward a regression to the mean. In other words, Les Miles has the lowest MOV ATS, but he has also been coaching the longest at his school (within this group of seven coaches). Even so, it is somewhat remarkable to find that every single coach in the SEC West has a positive MOV ATS. That means that each coach has outperformed public expectations. It is quite rare to find every coach in a seven-team division of a conference with a positive MOV ATS. 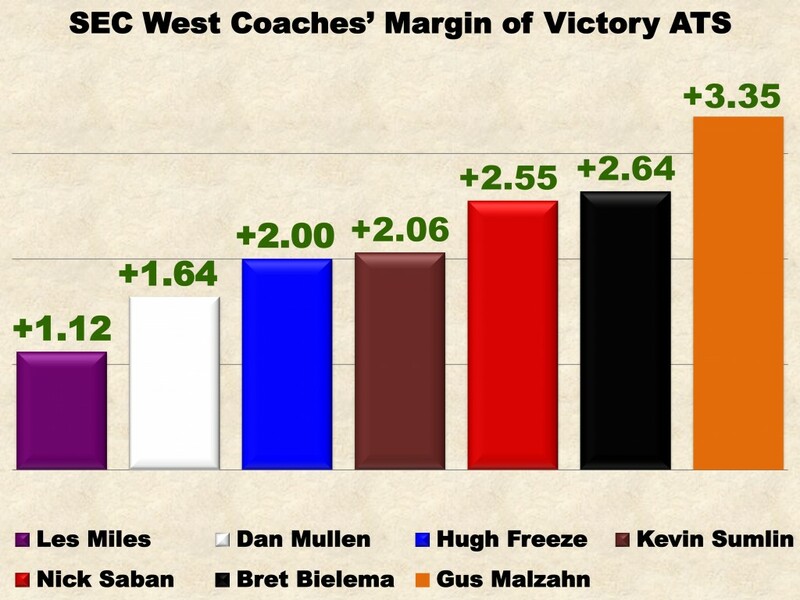 For our money, these data alone speak to the strength of the coaching in the SEC West.